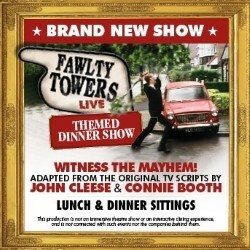 Based on the scripts by John Cleese and Connie Booth, Basil, Sybil, Manuel and Polly open the notorious dining room at the Fawlty Towers Hotel to the public for a night of cabaret like no other. Relive the golden era of television comedy and reacquaint yourself with Britain's most loved characters and scripts. Enjoy three courses of jaw-achingly hilarious cabaret and the gang's most iconic TV moments recreated in uproarious live action. Will the kippers be out of date or the wine be corked? Book your seats to find out!